There is now a large green Bike Box at the corner of King St & Water St in downtown Kitchener. It was painted today. Bike Boxes allow cyclists to pull in front of waiting traffic at a signalized intersection. It is intended to make cyclists more visible and to give cyclists a head start when turning. When used correctly, bike boxes significantly reduce the number of collisions between right-turning motorists and cyclists travelling straight through the intersection. They also improve safety for pedestrians. Photo Courtesy City of Kitchener Facebook page. Bike boxes have another use case: the "Copenhagen left". If you are biking and want to make a left turn at an intersection across traffic, that can sometimes be challenging or uncomfortable. Instead, you can pull right into a bike box on the cross street - and then go straight across the intersection when you get the green. The Spur Line trail project was approved by regional council today. A $4.75M project, with $3.2M for the trail itself ($2.0M from the Region, and $1.2M from Metrolinx, as part of their Active Transportation around GO stations budget.) $1.55 will come from the city of Waterloo for stormwater management upgrades. The project will go out for tender this winter, with construction next summer. Anticipated completion date is August 2015, assuming all goes to plan. Great news that the spur line trail has been approved, I was recently looking up information on this but could not find a current status update. No sidewalk on the west side of University? Anything along there without sidewalks on both sides is a bad proposal IMO. Four lanes for vehicles, four lanes for bikes, and only one sidewalk that doesn't even comfortably accommodate three people across? Yuck. It is odd that the proposal would be four lanes for bicycles (okay, two of them shared as part of a "multi-purpose trail," but that doesn't exactly make for a positive walking experience) but only one sidewalk less than six feet in width. I know this probably isn't realistic at this point in the Region, but a complete University Ave at this point would not have four lanes for vehicle traffic. 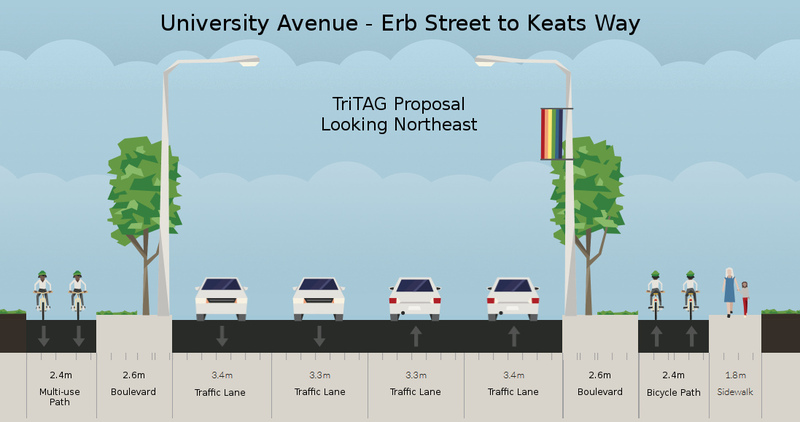 According to the Chicago complete streets guidelines, a Connector (a street with less than twenty-five thousand vehicles a day, like this stretch of University) should have one lane of traffic each way, with left-turn lanes as necessary. If we'd abide by that, we would have ample room for protected bike lanes, and the wide sidewalks that make sense near a major university campus. What's more, both would be used more frequently as they won't be adjacent to aggressively fast car traffic. (08-25-2015, 06:34 PM)kwliving Wrote: No sidewalk on the west side of University? Anything along there without sidewalks on both sides is a bad proposal IMO. 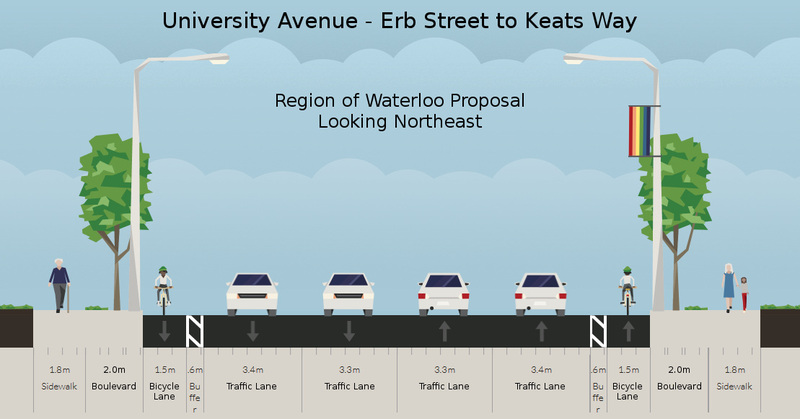 2) there is and will be nothing on University between Erb and Keats Way on that side for pedestrians to access. Immediately next to the road is the creek/drainage ditch and on the other side is the back of long lots on McDougall. Between the two of these I think the proposal looks pretty good, certainly better than the on-street bike lanes proposal. Do these make any difference, in your view? Having said that, I agree the widening of the general traffic area to four lanes is unnecessary, and I would extend that to the sections of the street that already have four lanes, as long as turns were permitted only where turn lanes exist (or, equivalently, turn lanes were provided wherever turns were permitted). Perhaps some turn lanes should be lengthened. I would rather ride in an on-street bike lane than in a multi-use path. It's safer that way. It is especially difficult to go from an on-street lane to a multi-use path and then back to a bike lane to continue along University Avenue. I also see potential for conflict with the right-turn lane onto Erb Street. I would take my chances in the lane with cars if it came to that. (08-26-2015, 01:15 PM)timc Wrote: I would rather ride in an on-street bike lane than in a multi-use path. It's safer that way. Do you have any stats backing this up? I seriously doubt it, particularly in the winter. Looks like there's going to be a rather long closure of the Iron Horse soon. This is a particularly annoying place for it to close. The detour options add a non-trivial distance. Thanks for the heads up. I really wish that the planning team would have waited for the Spur Trail to come online before starting this project. What they really need to fix is the section north of Union up to where the trail hits Waterloo. (08-26-2015, 02:00 PM)rangersfan Wrote: Thanks for the heads up. I really wish that the planning team would have waited for the Spur Trail to come online before starting this project. What they really need to fix is the section north of Union up to where the trail hits Waterloo. Yeah, my guess is that they want to set up a portable crane on that side of the building or something. It's a real pain. Doing "measure distance" on Google Maps, it looks like my best bet now will be to take the Spur Line Trail, such as it exists. I wonder how it's doing south of Guelph St... it had a lot of work still to go 2 weeks ago.